You have, I’m afraid, been given some confusing and incorrect information about why gallstones form and that is the good news. The bad news is that to treat the condition you need an operation to remove the diseased gallbladder, as gallstones usually form because it is malfunctioning. 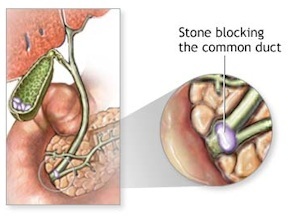 About 20 per cent of people aged 65 or over have gallstones, but generally there are never any symptoms. We live with them quite happily. Cholesterol stones account for more than 80 per cent of these. To understand how they form, it’s best to understand a bit about the gallbladder. This is a small pear-shaped organ behind the liver that stores bile. 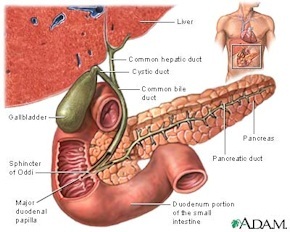 Bile is a liquid produced by the liver to help the body digest fats. It contains salts, fat molecules, including cholesterol, bilirubin (a breakdown product of haemoglobin, the red oxygen carrying pigment found in red blood cells) and water. Changing your diet to one lower in fat won’t make any difference in gallstones. 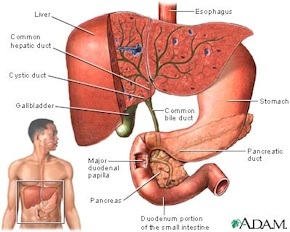 The liver secretes about a pint of bile a day; it makes its way into the gallbladder via channels known as bile ducts. The gallbladder then stores the bile, before releasing it into the digestive system as and when it’s needed. However, sometimes the bile remains in the gallbladder for long periods, where it becomes more concentrated. If the liver then produces too much cholesterol in the bile, small cholesterol crystals can form – these can then clump together to form insoluble stones, which gradually enlarge. There is no clear proof that diet is directly responsible for this, though there is a suggestion that our rich Westernised food – not the low-fat diet you’ve been told – is somehow linked. Other factors are family history and obesity – even the female hormone oestrogen is implicated, although how this might cause gallstones is not well understood. The stones themselves are often detected by chance – an ultrasound being carried out for some other reason – and if there is no pain, they are often left alone. But tummy pain, referred to as biliary colic, is a sign that the stones are either trapped in a duct or irritating and inflaming the gallbladder, and treatment then becomes necessary. Antibiotics can help settle any inflammation, but in both cases the gall bladder needs to be removed – simply removing the stones would not help in the long run, as the stones have formed because the gall bladder is behaving abnormally and more would form. Changing your diet won’t make any difference. The problem is not related to medication taken to lower your blood cholesterol levels, either. But don’t worry; you can easily function without a gall bladder. In fact, life without a gallbladder goes on as normal – the duct from the liver simply transfers bile direct to the intestine, in greater volume and more diluted than it would be otherwise, but the intestine adapts and sorts it out. The operation to remove the gallbladder will involve only two or three days in hospital, and you’ll be back to normal in a week or two. This may not be what you were expecting to hear, but the operation is effective and safe. The views expressed in this article are not necessary that of Peninsula Massage and is meant to be helpful information only and is not medical advice. If you have any of these symptoms, please seek medical advice.